The artists in NOT BIODEGRADABLE employ plastics or petroleum-based products in their process, either referentially, materially or both. With the exception of one, the artists are from Los Angeles. 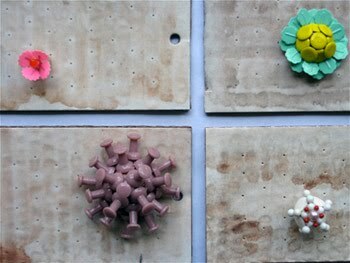 Linked through their choice of materials, they share a passion for how the non-biodegradable can be manipulated. Playfulness, exuberant obsessiveness and a love of color permeate their artwork. Each artist uniquely explores the capabilities of their chosen material. Whether plastic (which lasts hundreds of years), or petroleum (often wasted on fueling cars), the creative results suggest they may be better utilized in making art – then at least the art would endure forever. 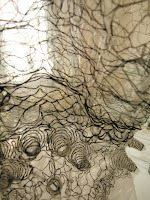 Alison Foshee, “Mother Board” (detail), push pins on cardboard, 8’x14′. 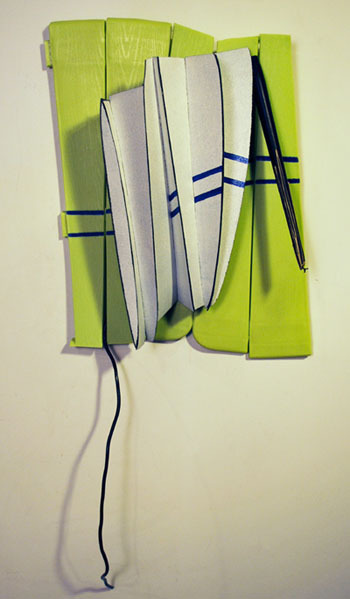 Alison Foshee tinkers with pre-fabricated objects such as plastic pushpins. She is particularly interested in the dual nature of these consumable goods. Simultaneously indispensable and without value, they function in her work as a not-so-subtle metaphor for culture’s subjective definition of what is precious. David Grant, “Damon”, sculptural latex. 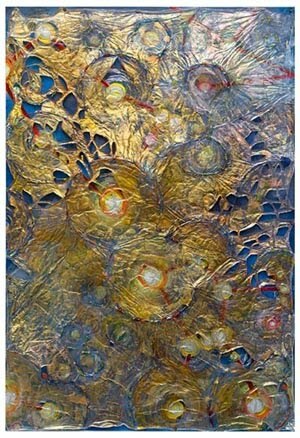 Mery Lynn McCorkle, “Winter Sky 3″, mixed media, 30 x 20”. Lower layer: acrylic, spray paint, glitter, pencil on denril; Armature: escutcheon pins & bronze wire; Upper layer: acrylic, autobody pigment, mylar thread on rayon paper. NOTE: The beads on the wire armature are in Morse code. In his sculptures, Jon Rajkovich merges fabricated objects with past impressions and elements of imagination. While alluding to their earlier history, he continues an object’s life cycle by placing it within a different context, where it has a new point of departure. Shirley Tse, “Vagabond or Wanderlust? #1″, plastic bag, 24 x 34 x 2”. For over a decade, Shirley Tse‘s installations, sculptures and photographs have engaged the philosophical implications of plastic as a phenomenon: transience, mobility, mutation, multiplicity and conflict that defines our contemporary society. 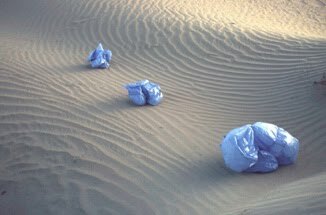 “The context in which plastic is seen calls for a dilemma between its phenomenological and semiotic significance. I realize plastic is more than a substance, it is a formula. It is a code. In our world, it becomes a site. A site that is physical, semantic and sociopolitical all at once”. Mireille Vautier, “Mue”, embroideries on plastic. Mireille Vautier creates embroideries on plastic bags. Her embroidery imparts nobility to these everyday, “useless”, non-biodegradable objects. 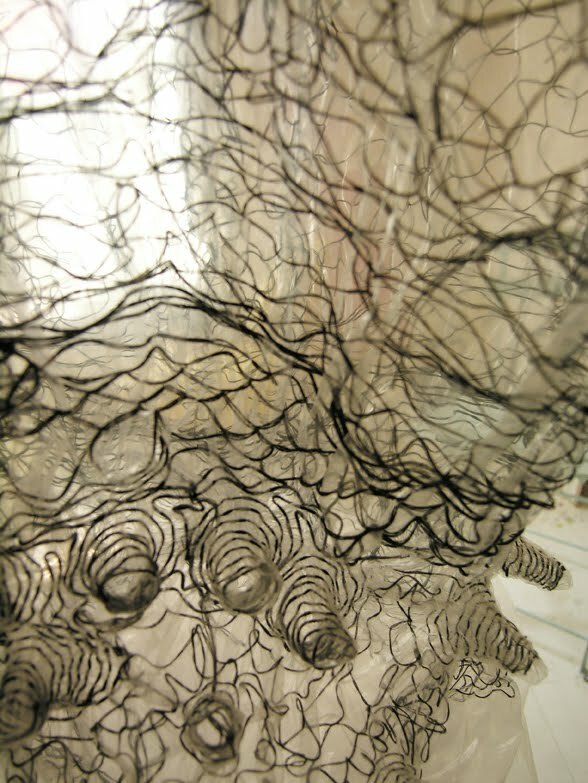 She transforms them into translucent, light-filled creations reminiscent of fluid membranes. This entry was posted in Alison Foshee, David Grant, Group Show, Jon Rajkovich, Leslie Kneisel, Mery Lynn McCorkle, Mireille Vautier, Shirley Tse on August 11, 2010 by Whitespace. We welcome you to attend presentations on the most recent innovations and solutions in the biodegradable plastics market. Topics will include: plastics sustainability, biodegredation testing, recent legislation, and more! The conference is September 20 &21, 2010.